Professional florists will create an elegant bouquet in your choice of colors and flowers. 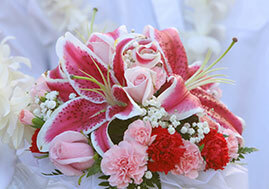 Traditional roses, delicate and tropical Dendrobium orchids, Anthuriums or Lilies. Trying to decide? ….. we can help. Sample bouquets below. See more bouquets on our FACEBOOK page .... and LIKE us! Decorated with an informal arrangement of fresh orchids and delivered to your hotel or reception. Made with all natural ingredients from our specialty bakery! Everyone loves our wedding cakes that will serve 8 - 10! It’s difficult to choose from the light Vanilla, Strawberry and Cream, Haupia Coconut Cream, Devil’s Food, Kona Macademia, or Passion-Mandarin. Photos begin as you arrive…..continue during the ceremony and afterwards for special formal or fun shots. Using only the newest, top of the line camera and video equipment, you’ll have a complete CD and /or fully edited professional DVD with full reproduction rights. Have a special photo you would like?….. just ask! Chairs for guests may be added: a classic white wooden chair or the more formal with white drape and your choice of sash color. A romantic and elegant addition to any wedding! 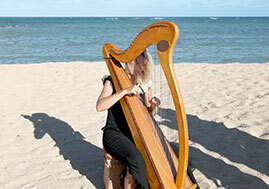 Singer with ukulele or guitar, the beautiful Hawaiian Wedding Song, and island favorites ... or include a beautiful Hawaiian Hula Dancer.